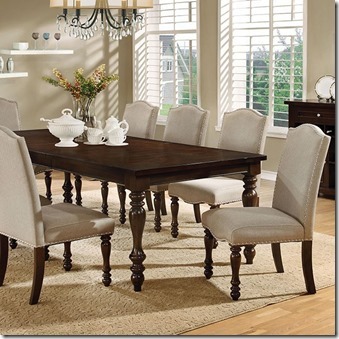 Furniture for the home, with hundreds of brands to choose from and special discounts offered regularly. CHECK OUR PRICE BEFORE YOU BUY ANYWHERE! WHAT IS YOUR DINING STYLE? 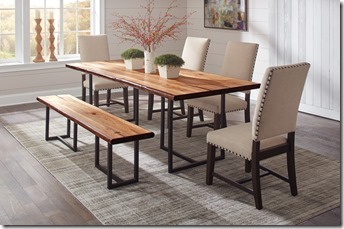 Call us for pricing on these "LIVE EDGE" dining tables and benches. than the MSRP pricing that you see on the internet. More Styles below for you to choose from. 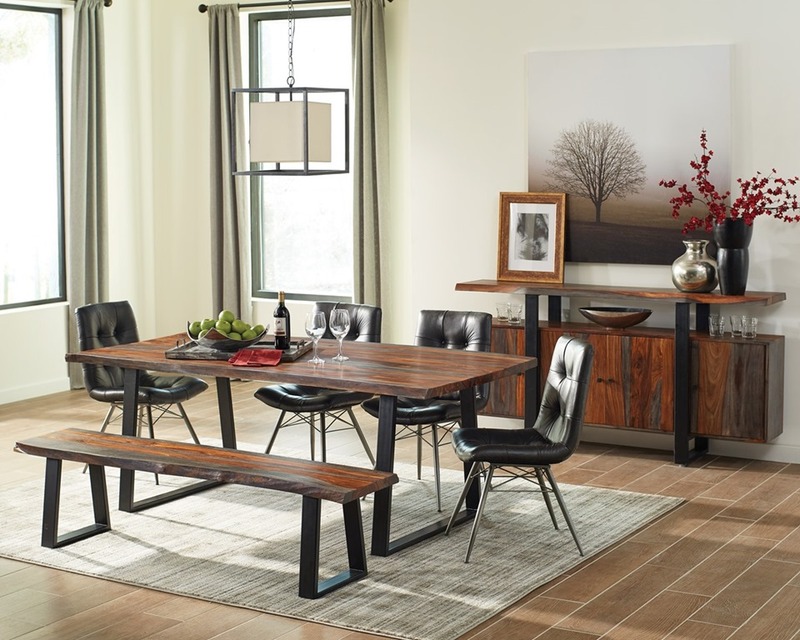 LEFT side - #DR3018PT This transitional dining style counter height set features clean, linear lines with cozy brown cherry hues. 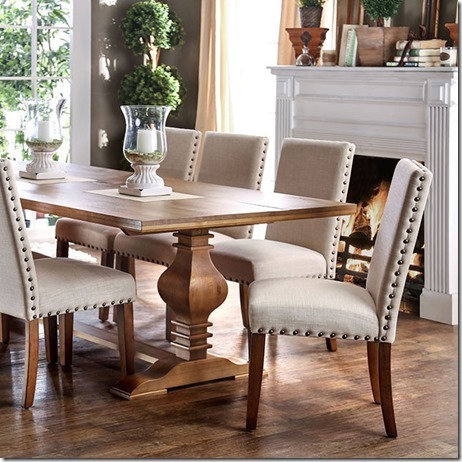 The ivory linen seats are lined with nailhead trim. 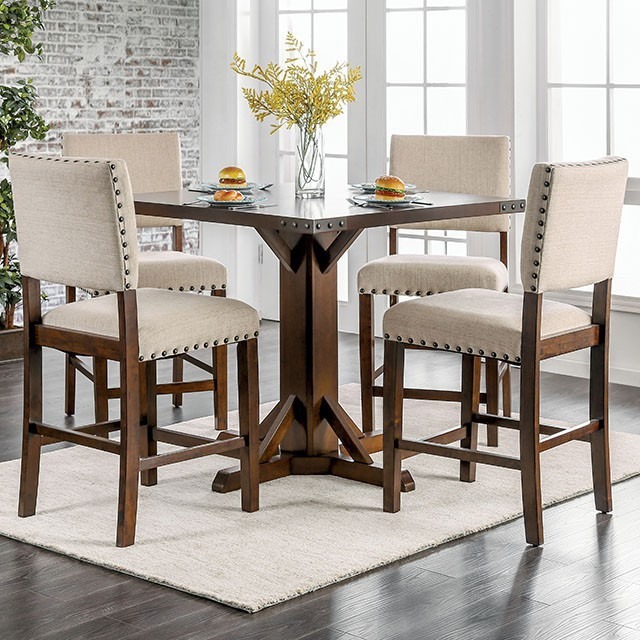 The pedestal base and corner rivet details complete this look that will prove to be a hit in any dining setting. 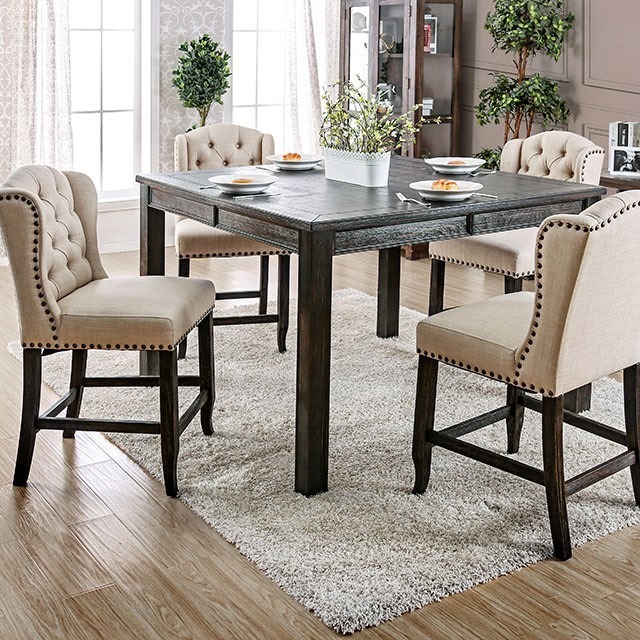 RIGHT side - #DR3133T Bring some classy inspiration into your dining room with this warm toned table featuring stylish turned legs. 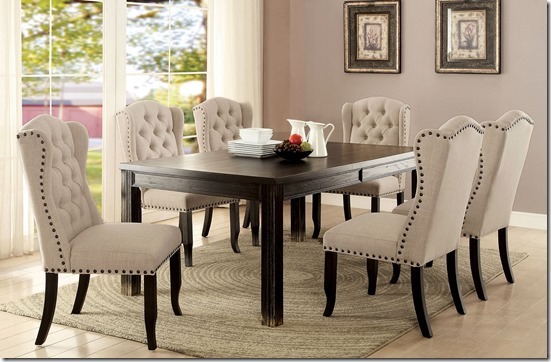 Matching side chairs beautifully wrapped with linen-like upholstery and nailhead trim. 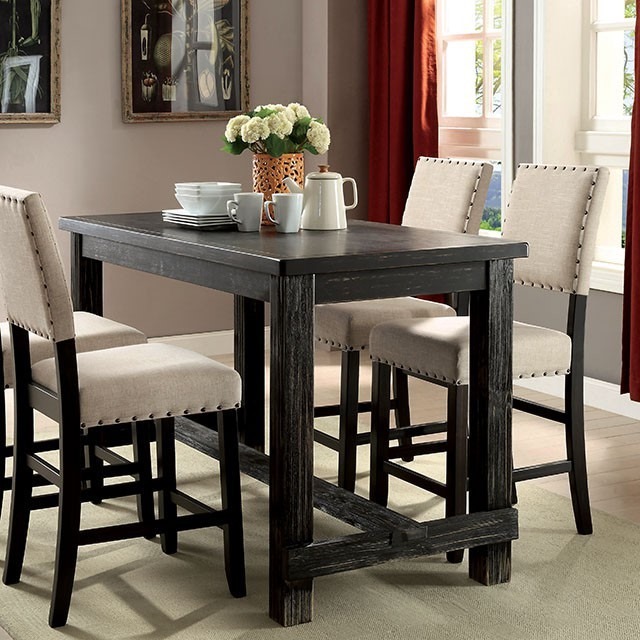 Left side - #DR3324bk-pt - Rustic charm hits its peak with this stunning counter height dining set. 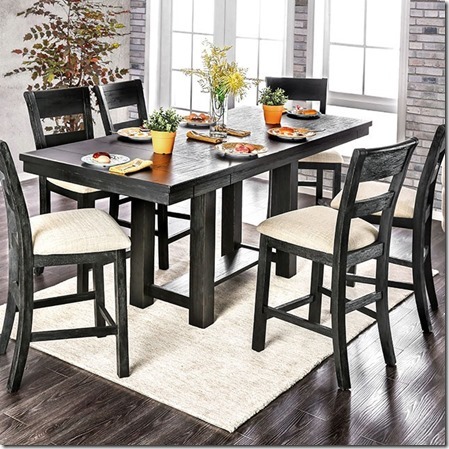 The rustic wood grain and distressed black finish achieve an inviting, homey atmosphere. 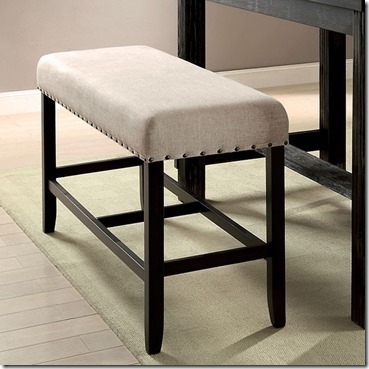 Ivory linen-like upholstery adds a brightening effect with nailhead trim. 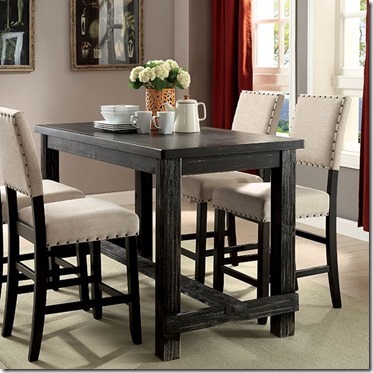 Table measures 60"L X 30"W X 36"H so this set will fit into smaller places AND/OR used as a desk. The wingback stools would also match this table. ALSO see a lighter finish below. ALSO, AVAILABLE IN BAR HEIGHT!!! 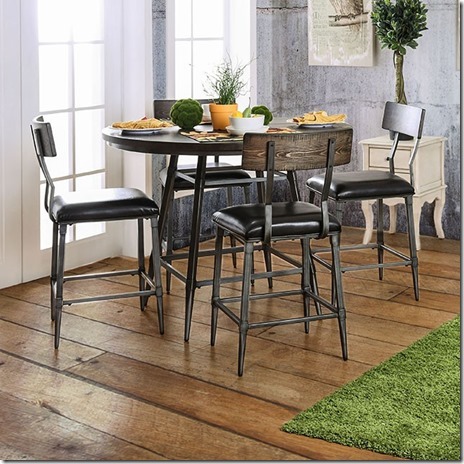 Set it up against a wall or window with 2 stools!! LEFT SIDE - #DR3324bk-pt-54 Rustic charm meets upscale design in the form of this stunning collection. homey atmosphere that will have family and friends coming back for more. 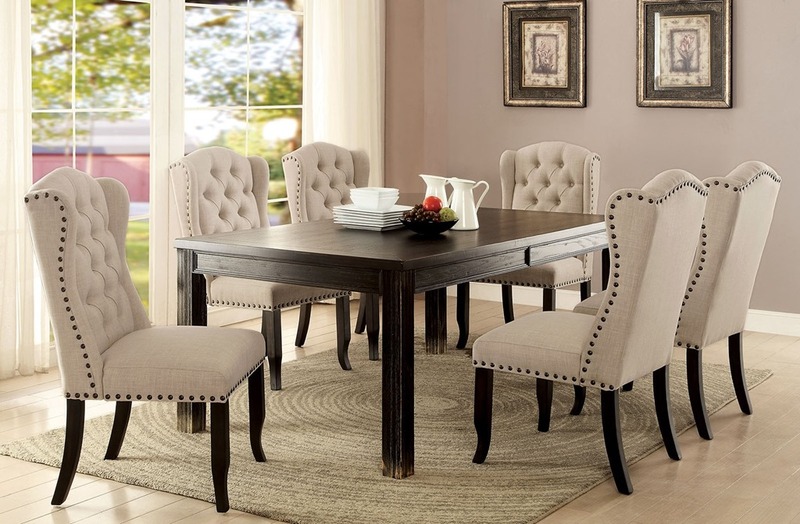 Elegant ivory linen-like chairs add sophisticated appeal with their wingback sides, button tufting and nailhead trim. The size of 54" x 54" x 36" H will seat up to 8. The square back upholstered stool could also be used with this table. #DR3324PT - The distressed black finish above is also available in the natural finish. 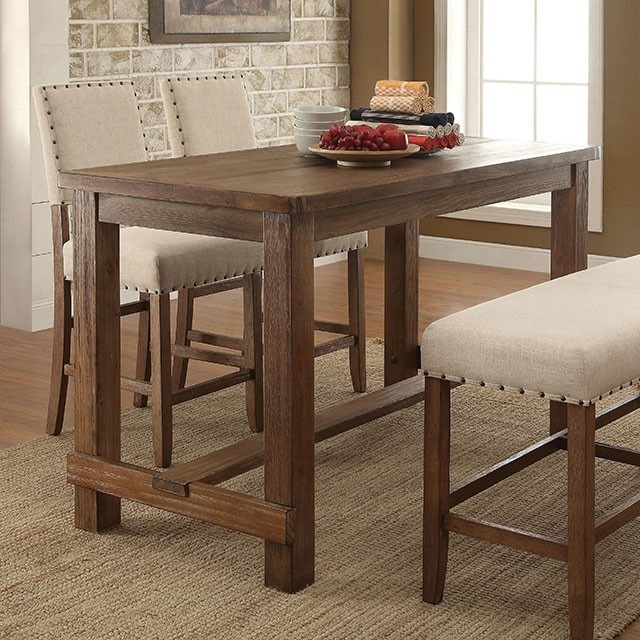 Designed with convenience and style in mind, this rustic dining collection is a gorgeous addition to any environment. The paired coloring between natural toned wood and ivory linen-like upholstery creates a bright and inviting atmosphere for a space-conscious studio or loft. 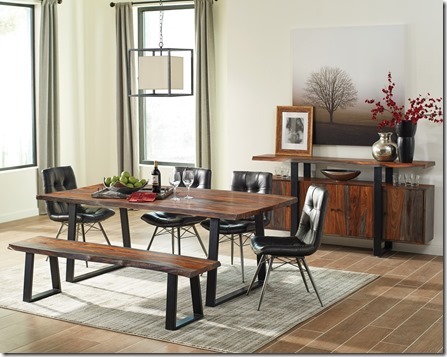 The plank style surface offers ample room while adding emphasis to the solid wood construction. Available with chair or bench options. *THIS TABLE COULD ALSO BE USED AS A DESK!!!!! A person could sit or stand to work. 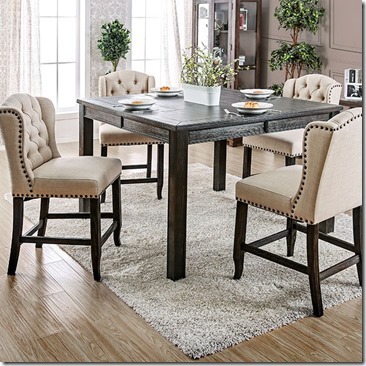 DR3370RPT - Gather around this counter height table for a casual and relaxing meal. 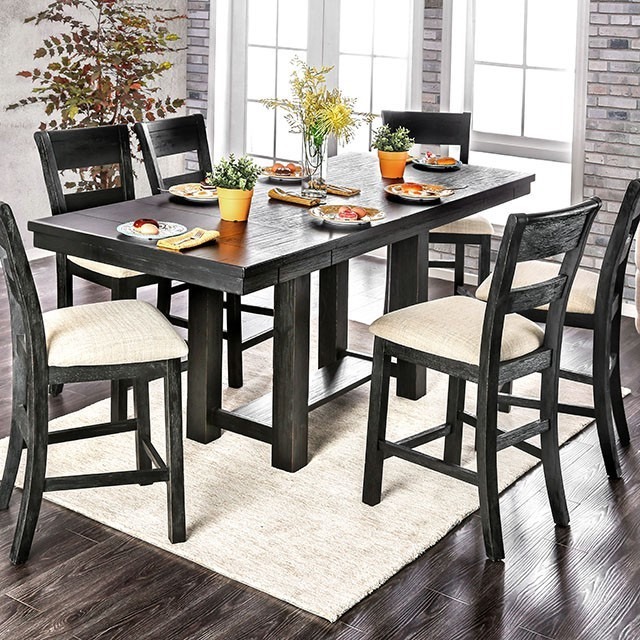 This five-piece set features a handcrafted distressed exterior with a rustic-inspired weathered gray finish. The mixture of metal and wood offers a sturdy and capable framework to ensure long-lasting durability for years to come. Smooth leatherette seats add to the comfort and appeal of this industrial piece. 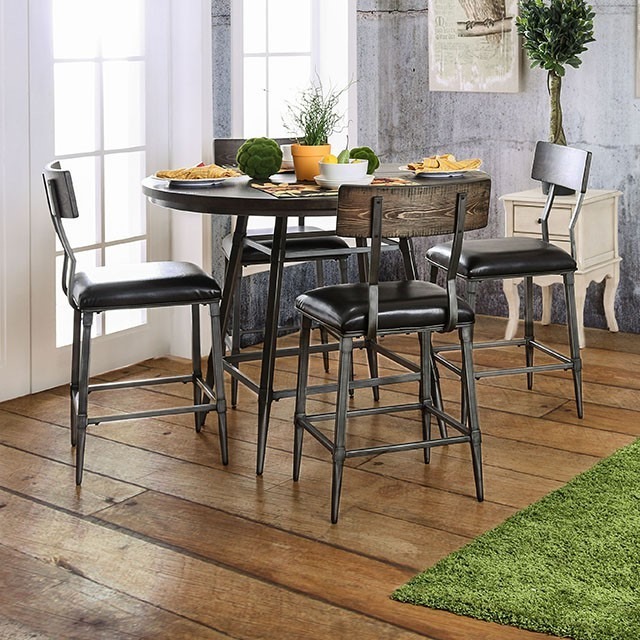 *The stools can be purchased separately for use at a counter. 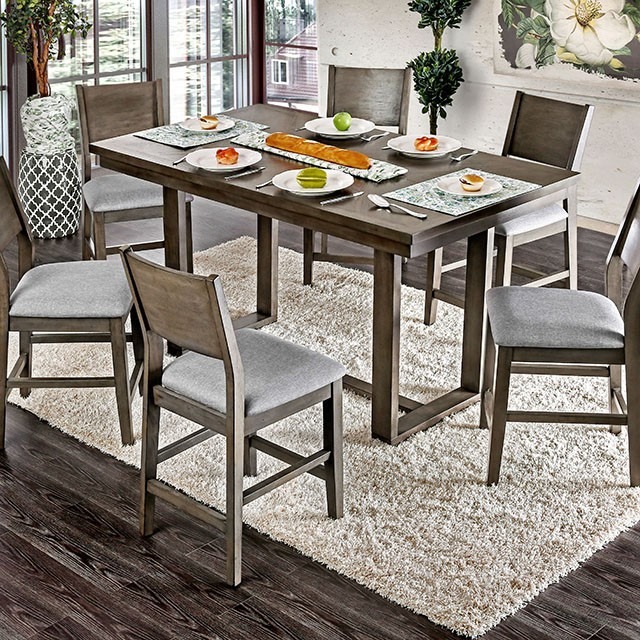 #DR3441T - Celebrate the most festive occasions with this large and spacious dining table. The rectangular top measures 94 inches across allowing up to eight of your guests to be seated. Underneath is a beautiful display of intricate carving on the trestle base. 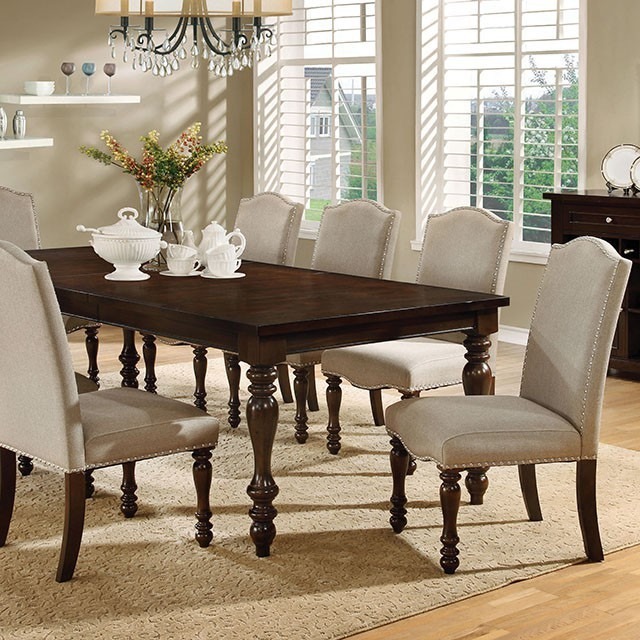 The ivory chairs have upholstered seats and backs for extra comfort. 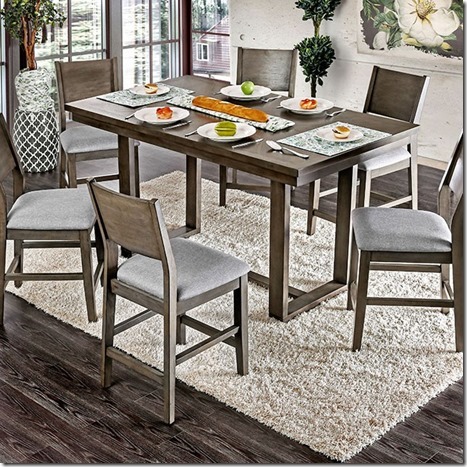 #DR3543PT - COUNTER HEIGHT TABLE IS 86"L X 36"W X 36"H When it's time to modernize your dining space, this counter height set is ready. 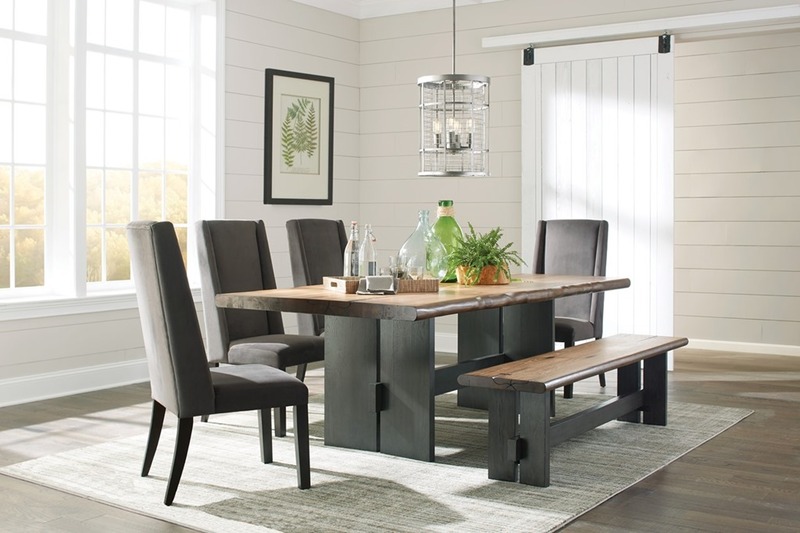 Featuring crisp and clean lines and a brushed black finish, this thick table top is sturdily supported by the wood block legs beneath. 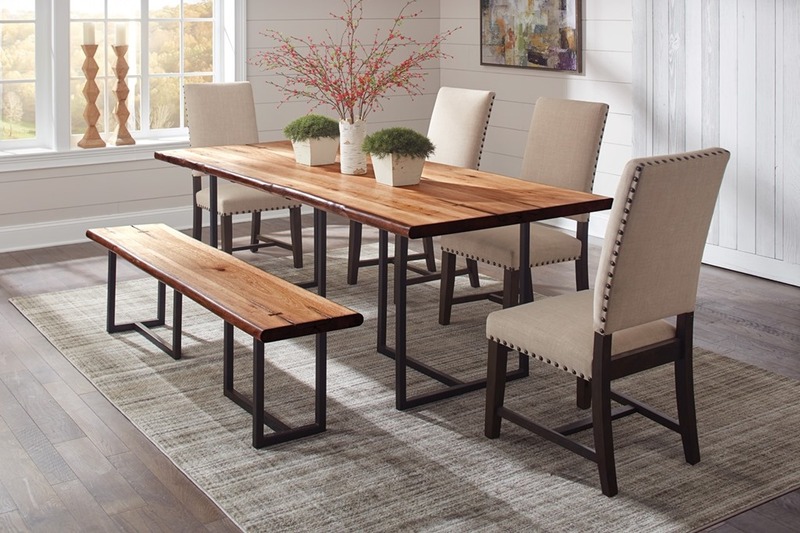 A set of coordinating chairs add to the elegant style with their slatted backrests and contrasting fabric upholstery. #DR3986PT - COUNTER HEIGHT TABLE IS 66"L X 38"W X 36"H.
Perfect for casual family dinners or game nights, this contemporary style counter height set provides the ultimate cozy atmosphere. 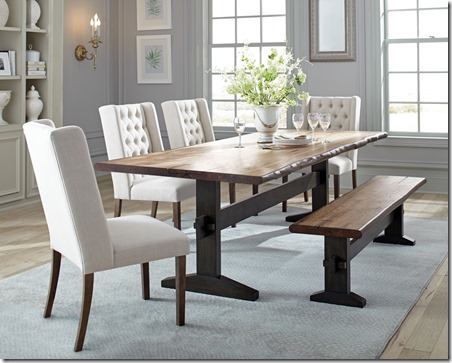 The soothing gray finish is complimented with light gray fabric upholstery for a classic look. A center beam provides extra support and added charm to blend style and functionality into one beautiful piece. This is only a small portion of what we have available. CHECK BACK SOON or click SHOP VENDORS at the top of the page..
Keep in touch. You never know when we might move, again! Special promotions. Be the first to know. We don't advertise. Please fill in all fields and click the submit button once—do not double-click. This information is strictly confidential and will not be shared or sold. 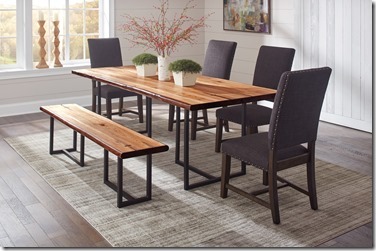 Follow Joel Jones Furniture's board Flexsteel Reclining Furniture on Pinterest. No images or content on this site may be used or reproduced without consent.